Display your fun, family photos or snapshots from special events all year round with a pack of custom photo calendar. This gift set comes with four identical personalized calendars, making them the perfect gift for your friends and family. Easily design these stand-alone desktop calendars online and create stunning gifts for your loved ones. Create your own personalized calendar 2019 with a four pack of customized A6 calendars. As well as being the perfect Christmas gifts for friends and family, you can also choose your starting month so they can be enjoyed from any point in the year. Your pack will come complete with four identical A6 calendar featuring 13 of your photos or designs including the front cover, printed to the highest quality with vibrant color and sharp details. You can also edit the background color and photo captions featured in each month. The built-in stand means the calendar can be easily displayed on any desk or table top, creating a versatile present. 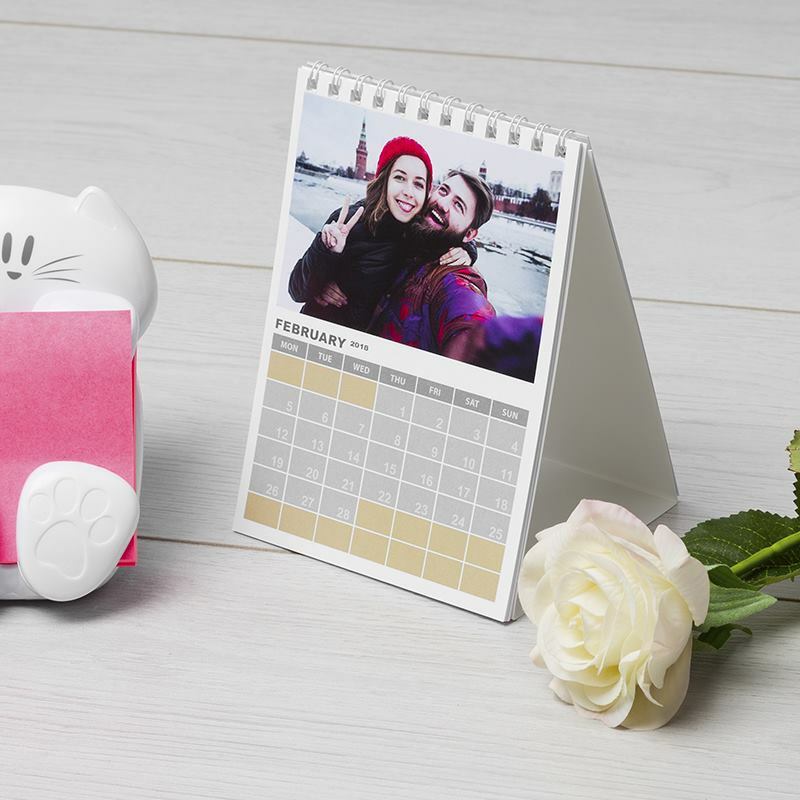 Give a gift that will leave a lasting and warm impression with this desktop A6 calendar. What Will My Personalized A6 Calendars Look Like? Celebrate the year with these stunning A6 calendars. Choose up to 13 of your own photos to create a fun and personal calendar, or create photo collage montages in our online design studio. Your designs will be beautifully printed on high quality 4.72oz paper with a satin finish, giving a smooth and modern look. The paper is backed onto cardboard to create a sturdy and durable calendar, which is completed with a white metal wire binder. Your photos will be reproduced using environmentally friendly inks which give a vibrant color and produce beautiful calendars which will be remembered for a lifetime. Every calendar is handmade onsite by our skilled crafters, and given the highest level of care and attention. Take advantage of our 3 for 2 offer and add 3 calendars with the same or different design in your basket and the discount will be automatically applied. Your designs will be beautifully printed on high quality 4.72oz paper with a satin finish, giving a smooth and modern look. The paper is backed onto cardboard to create a sturdy and durable calendar, which is completed with a white metal wire binder. Your photos will be reproduced using environmentally friendly inks which give a vibrant color and produce beautiful calendars which will be remembered for a lifetime. Every calendar is handmade onsite by our skilled crafters, and given the highest level of care and attention. Care: Your A6 calendar is made to last, and can be wiped clean with a dry tissue if necessary. Please take care not to get your calendar wet. These packs of personalized calendars 2019 are the perfect for Christmas gifts for all your friends and family, when they’re ready to bring in the new year with a smile. You could feature photos from special family events such as a wedding or birthday, or happy memories throughout the year for your loved ones to display proudly in their homes or offices. You can even add dates and locations to each photo by choosing the text option in our online design studio. Why not try designing a calendar with a theme, such as animals or food? These are great for friends or co-workers; the fun and quirky designs will be sure to brighten up their homes. If you want to create a party favor that would be more suited to a larger crowd, you could design a calendar with abstract artwork or photography, and choose a background that will match your color themes. These calendars are perfect if you’re wanting to give a gift at any point in the year, and can create a stunning piece of décor. Gorgeous printed satin book cloth cover, corner pieces, and colored spine make this piece stand out.